In 2006, the GDP for financial services was nearly $1.1 trillion. Total U.S. financial assets stood at $44 trillion in 2007, meaning that the financial services industry as a whole is skimming 2.5% a year out of everyone's wealth. Some of these costs are obvious, like ATM fees, insurance premiums, mutual fund expense ratios, brokerage commissions or investment advisory fees. Some are hidden or at least require some extreme effort to discover. These costs have a supreme effect on personal wealth. For mutual funds, hedge funds, and stocks there are hidden costs such as managerial fees or marketing expenses that can cost investors at least 3-6% of their earnings. These dangers to investors are real, and Loeper sheds light on the oft unseen deceit of the financial services industry. The emotional sales and marketing that victimize your wealth and lifestyle abound. Some of the most misleading of these marketing tactics even have the nerve (or lack of ethics?) to position their firm as being the objective, honest segments of the industry. The majority of investors are victims, of charlatans, smooth talking and good looking salespeople, or effective advertising and marketing designed to evade reality and prey on emotional desires. This audiobook serves as an advocate of the consumer... to expose what insiders know about the side of the sales pitches that consumers don't, but need to hear. 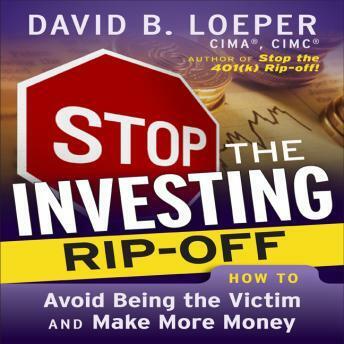 Stop the Investing Ripoff exposes questions every investor should ask during a financial sales pitch before they pull the trigger and buy the next book, magazine, mutual fund, or advisory service. It is based on David Loper's nearly 25 years of experience of seeing the inner workings of the industry.